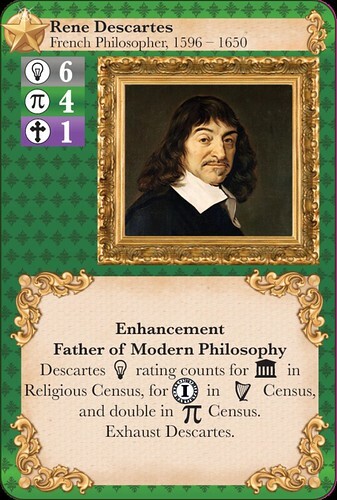 Isaac Newton, Rembrandt, Oliver Cromwell and Moliere come to life as 17th century monarchs vie to be the most influential in Europe. 341 backers pledged $27,684 to help bring this project to life. The luminaries are rated in between one and seven different areas of endeavour: military, politics, religion, ideas, science, art or wealth. Additionally, each luminary has a unique Action, Enhancement or Response based on their real historical achievements to be brought to bear in service of your nation. Consider the difference between Rembrandt and Vermeer. Both are important and wonderful artists. But in the real-life Dutch Republic, Rembrandt was famous and well-patronized, composing hundreds of celebrated portraits in his career. Vermeer was obscure produced an order of magnitude less art in his career. 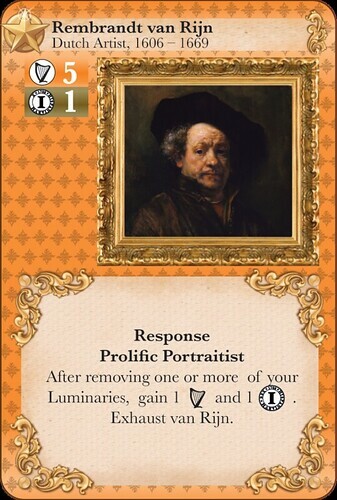 In Road to Enlightenment, Rembrandt has higher ratings and gives you a benefit every single time another luminary is removed from the game, reflecting the influence and nature of his portraiture. 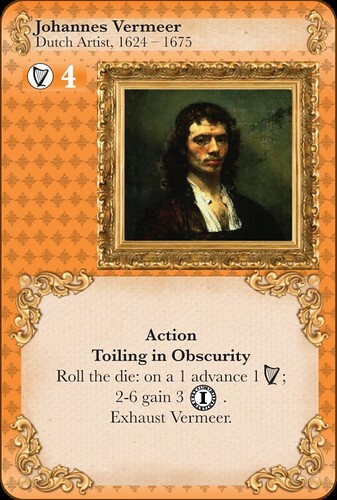 On the other hand, Vermeer only provides a modest benefit to reflect the limited impact his career had at the time. Invading other countries in the 17th century was a complex mix of cultural, religious and logistical considerations. These have all been baked into the various territories on the map, making it quick and easy to make decisions around where to try and attack. You can only attempt to invade territories that have your nations colour on the top of the circle. Those are the only nations that could have even possibly successfully invaded that territory in real-life. The number associated with each nation's colour indicates how difficult it would be to successfully conquer. 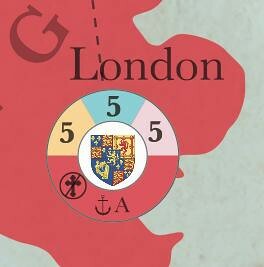 In the case of London, it is very difficult for Spain, France or Sweden to conquer it. 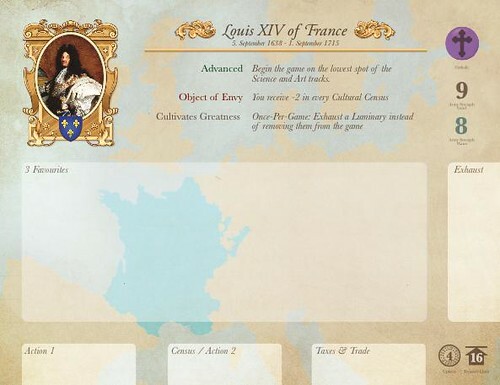 The religious symbol in the lower left corner lets the player know whether the territory is primarily Catholic, primarily Anti-Catholic (Protestant, Russian Orthodox and other Christian branches) or primarily Islamic. If it is successfully invaded by a nation with a different religious affiliation it has an impact on the continental struggle between religions. 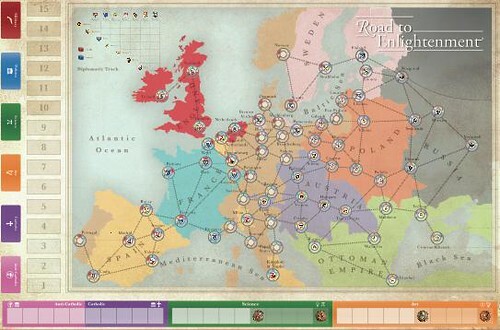 The lines connecting into London, and the anchor with an "A" in the lower right corner, indicate which territories need to be held by a player before they have access to attack. 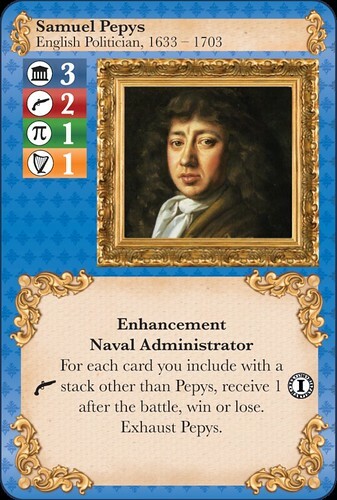 The anchor with an "A" indicates that any player who already owns another Atlantic port territory is connected and could choose to attack over the water. With Road to Enlightenment, all of the intricacies related to managing military expansion is baked into these easy-to-use board mechanisms. 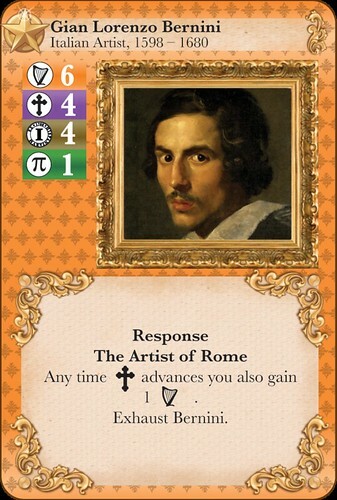 In order to create a game that simulates the battle between nations for prestige - covering war, politics, religion, science and art - while focusing on many of the diverse people of history, we've mashed up aspects from wargames, Euro games, deck building games, and statistical sports simulations. While it is an eclectic mix, this broad spectrum approach to the game's design enabled this diverse and richly detailed set of conditions to come together in a game that is epic in scale but doesn't take all day to play. And we absolutely will be kicking it forward. 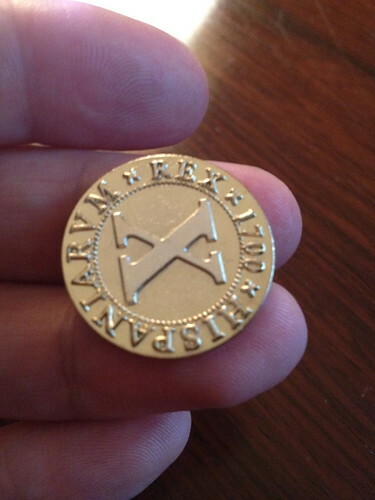 We've created a limited number of sets of gorgeous metal doubloons as an "extra" for the game. If you like to pimp out your games and want to replace the serviceable cardboard money in the box with these beauties, buy a package that adds them to your game. And for a limited number of gamers who aren't interested in Road to Enlightenment but want some of these sweet, sweet peripherals, you can buy them on their own as well. We've seen metal game coins sold on Kickstarter before, but nothing as intricate as these historically modeled, edgeless (hand-stamped-style) doubloons. Edge set include quantities 5, 10 and 40 of denominations 10, 5 and 1, respectively. For all backing levels below $250, please over-pledge by $15 for Canada, $30 elsewhere in the world. 1. We are offering a $70 level for which you can pick up your copy of Road to Enlightenment at Spiel 2012 in Essen, Germany in October. Back for $90 and pick this reward level to also get a set of metal doubloons. If you have already backed at a higher level but want Essen pick-up you may decrease your pledge and pick this option! 2. We are offering 3-game packs to Canada for $195 with free shipping. 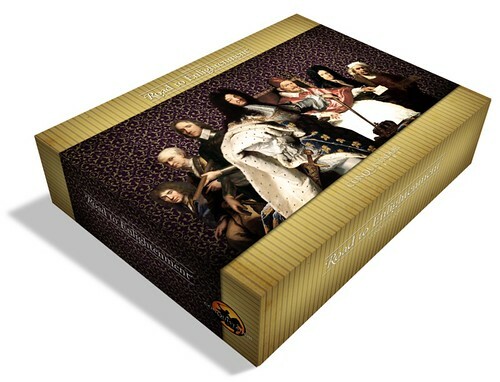 Overpledge in $20 increments to add sets of doubloons to this backing level. You may also add more copies of the game at $65 each. If you already backed for a single set and are interested in this package, either increase your original pledge and choose this option, or cancel your pledge and include your order with someone else's you are coordinated with. THANK YOU to all current backers and those who have pushed for these new options. Special thanks to Derick Bores for creating our videos! Support our attempt to bring the great people of history to life. Receive access to all project updates, plus an advanced copy of the Road to Enlightenment Strategy Guide (PDF) which will be given to all backing levels. 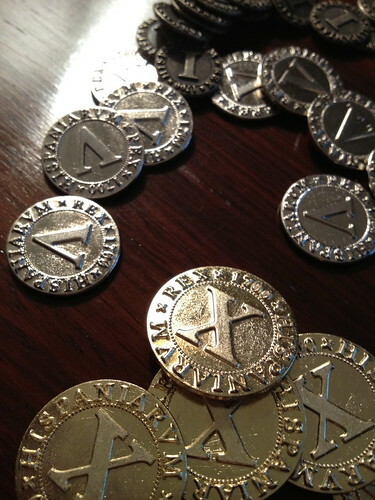 Receive 1 set of metal doubloons, and free shipping in the U.S. If you also want to order the game pledge at the $85 level. Add $15 for shipping to Canada, $30 anywhere else in the world. Spread the knowledge and culture to those who deserve it. Donate 1 copy of Road to Enlightenment to a school, library or other civic or non-profit organization of your choice. We will ship directly to the organization anywhere in the U.S. and include a hand-signed letter explaining you are the donor of this game. Add $15 for shipping to Canada, $30 anywhere else in the world. Receive 1 copy of Road to Enlightenment, with free shipping in the U.S. Add $15 for shipping to Canada, $30 anywhere else in the world. Purchase 1 copy of Road to Enlightenment for pick-up at Spiel 2012 in Essen, Germany this October. 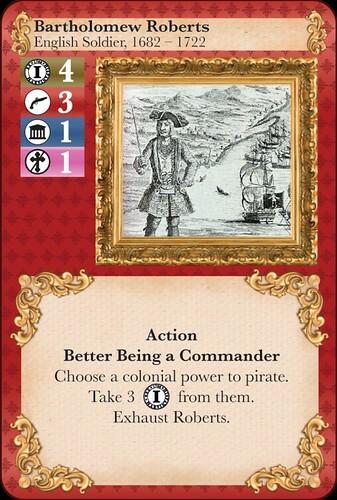 If you would also like a set of doubloons back for $90 and select this reward level. Receive 1 copy of Road to Enlightenment, 1 set of metal doubloons, and free shipping in the U.S. Add $15 for shipping to Canada, $30 anywhere else in the world. Receive 3 copies of Road to Enlightement, with free shipping in the United States and Canada. 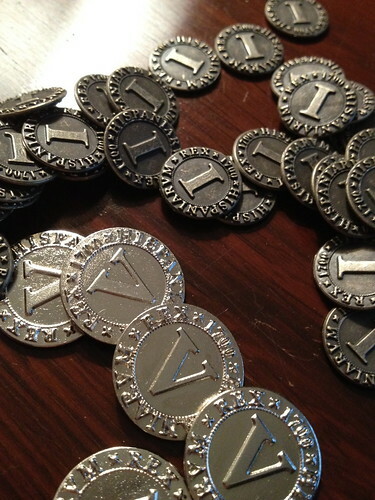 Over-pledge by $20 for each set of metal doubloons you would like to add. Additional games can also be added for $65 each. 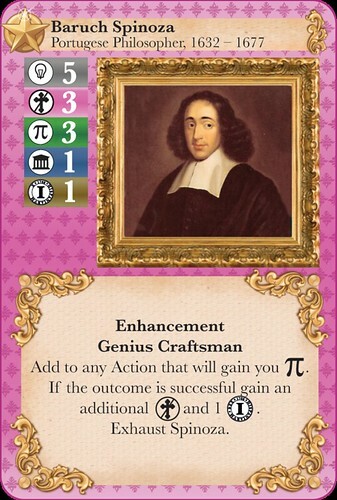 Join the planning team for determining which luminary cards will be included in future card expansions to the game. You will have access to private conversations with the designer and other decisions makers, the opportunity to provide feedback into both who is included and what their final cards look like, and will participate in the inner workings of game design and development. You will additionally receive 1 copy of Road to Enlightenment (autographed if you choose) and metal doubloons, shipped anywhere in the world. Everything at the $250 level, plus a second copy of the game and doubloons, plus be treated to lunch or dinner by Road to Enlightenment designer Dirk Knemeyer at Origins 2012 (Columbus, OH, US). Get the inside scoop on upcoming games, the extensive design history of Road to Enlightenment, or anything else you fancy. Everything at the $250 level, plus a second copy of the game and doubloons, plus be treated to lunch or dinner by Road to Enlightenment designer Dirk Knemeyer at World Boardgaming Championships 2012 (Lancaster, PA, US). Get the inside scoop on upcoming games, the extensive design history of Road to Enlightenment, or anything else you fancy. Your games can be shipped earlier or given to you at the World Boardgaming Championships, your choice. Everything at the $250 level, plus a second copy of the game and doubloons, plus be treated to lunch or dinner by Road to Enlightenment designer Dirk Knemeyer at BoardGameGeek Con 2012 (Dallas, TX, US). Get the inside scoop on upcoming games, the extensive design history of Road to Enlightenment, or anything else you fancy. Your games can be shipped earlier or given to you at BoardGameGeek Con, your choice. Everything at the $250 level, plus a second copy of the game and doubloons, plus be treated to lunch or dinner by Road to Enlightenment designer Dirk Knemeyer at GenCon 2012 (Indianapolis, IN, US). Get the inside scoop on upcoming games, the extensive design history of Road to Enlightenment, or anything else you fancy. Your games can be shipped earlier or given to you at GenCon, your choice.